We’re all well aware that scents (and odors) can evoke memories, set a mood, or calm one’s mind. The use of essential oils as a form of therapy is nothing new and is relatively common in the human world, but did you know dogs can benefit from it, too? 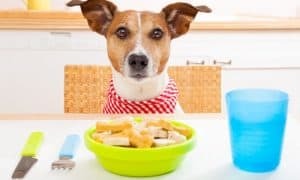 Because dogs are so adept at detecting scents, with olfactory systems far more advanced than our own, it’s no surprise that introducing certain, specifically selected, scents can alter a dog’s physical and emotional state. Aromatherapy is believed to improve the emotional, cognitive, and physical well-being of an individual when he or she inhales or absorbs essential oils through their skin. These essential oils are extracted from stems, bark, flowers, roots and leaves of certain plants. There are a wide range of essential oils available especially for the benefit of dogs. The use of certain oils can treat itchiness, repel fleas and ticks, and fight infections. While other essentials oils can be used to promote a sense of calm or to ease anxiety, particularly during stressful situations such as travel and bad weather. In addition, using essential oils in the home, on the body, or through a diffuser will, at the very least, fill the air with a pleasant aroma. How do I use essential oils for my dog? 1. As a misting spray. Mix 20-30 drops of essential oils per 8 ounces of distilled water in a spray bottle. The liquid can be misted directly onto your dog’s fur (avoiding the face, mouth, and eyes), onto his bed or blankets, or onto the carpeting in a favorite room. 2. As a massage oil. For massage, add 2 to 3 drops of essential oil to one ounce of base oil. Rub the oil mixture onto your hands and use as you would any massage oil. 3. In a diffuser. There are a variety of different diffusers available, each with their own instructions for use. Chamomile (Roman): helps to calm the mind and body, great for treating anxiety, soothing teething pain and muscle cramps. 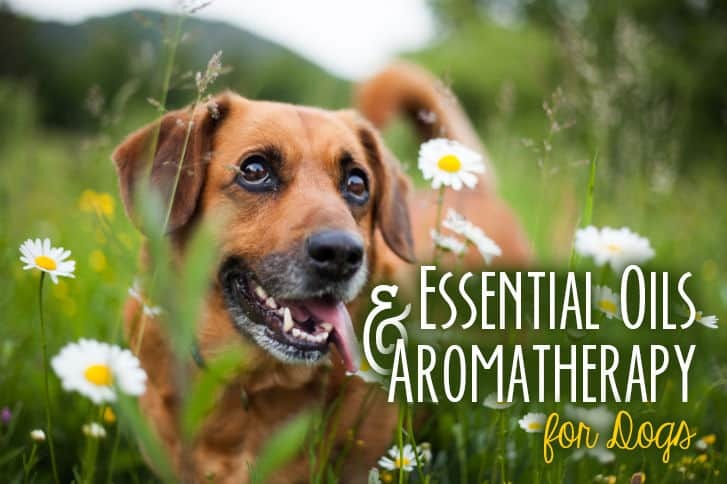 Chamomile is considered a “must-have” essential oil for dog owners. Calendula: helps to heal physical wounds, especially when used as an oil. Catnip: an excellent natural pest repellent in the air or on your dog. Cedarwood: antiseptic, good for skin and coat conditioning, allergic dermatitis, and naturally repelling fleas. Eucalyptus: antibacterial, anti-inflammatory, and antifungal, especially beneficial for skin irritations, clearing congestion, and naturally repelling fleas. Geranium: antifungal, for use in healing skin irritations and fungal ear infections, also effectively repels ticks. Lavender: analgesic and soothing to irritated or itchy skin, also promotes a sense of overall calm. Myrrh: anti-inflammatory, reduces the production of scar tissue as skin heals. Peppermint: therapeutic for dogs with arthritis, hip dysplasia, muscle strains and sprains. Naturally repels insects. Tea tree oil: helps cuts, scrapes, and other wounds to heal. Valerian: naturally calming, especially useful for dogs with separation anxiety, noise fears, and during travel to ease nerves. Ylang Ylang: slows down rapid breathing and elevated heart rate, calms and improves mood. 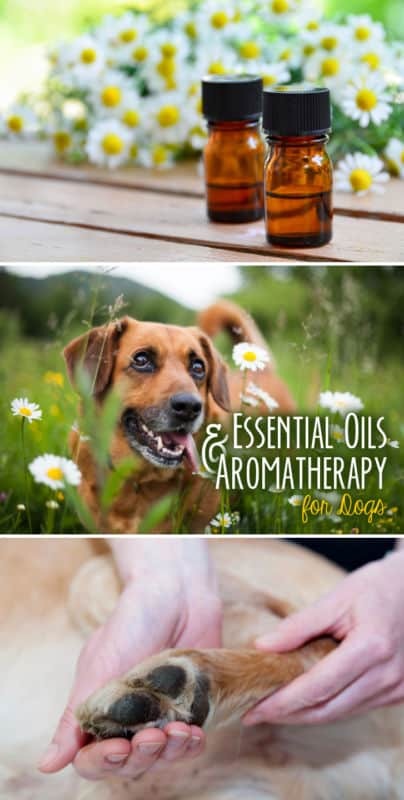 Because a dog’s sense of smell is so much more acute than our own, the use of essential oils can sometimes be overwhelming. 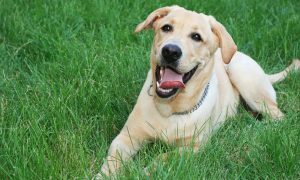 For dogs, much less oil is needed to achieve results. You’ll know that an aromatherapy treatment is too overwhelming for your dog if his eyes water, he begins sneezing, pacing, or whining. And, if you share your home with both dogs AND cats, be sure the oils you’re using are safe for both. Certain essential oils that are safe and effective for dogs can be highly toxic to their feline friends. Do you have any experience with essential oils or aromatherapy for your dog? Please, share your experiences in a comment below! 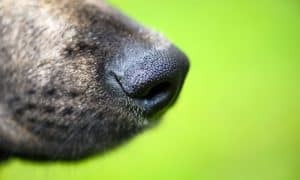 A Closer Look at Your Dog’s Most Useful Feature – His Nose! Please be extremely careful with EOs around animals! I’ve used them cautiously for many years in our holistic rescue sanctuary & boarding business. Not cautiously enough, unfortunately. Diffusing an EO combination for a heart problem in one of my dogs likely caused a seizure in another. We narrowed the problem down to ylang ylang, which is recommended in this article despite being known to cause seizures in vulnerable animals. It was the worst seizure I’ve ever seen, & my pup is a super healthy 18mo. I’ll never diffuse around my guys again & will stick with misting sprays. Love this article! Which are best to use in a diffuser with dogs? I’ve only used lavender so far.